Dr. Ari Cale has four passions in life. She loves the Lord and relishes every opportunity to share the Gospel. As a newlywed, she is happily in love with her husband, David Rafael. And she enjoys being a family medicine physician in a South American mission hospital. Then there’s her fourth great love—the sport of Frisbee. By day Ari Cale is a dedicated doctor caring for patients in the clinic at Diospi Suyana Hospital in Curahuasi, Peru. But in the evenings and on weekends, she trades in her stethoscope for sneakers and a plastic disc. Frisbee players have a devotion after the game. This is not your every day casual toss-and-catch in the backyard. We’re talking serious competition. Fans of the game call it “Ultimate Frisbee,” or simply “Ultimate.” It combines the ideas of American football and soccer, with the objective to score by passing the Frisbee downfield until it is caught in the opposing team’s end zone. 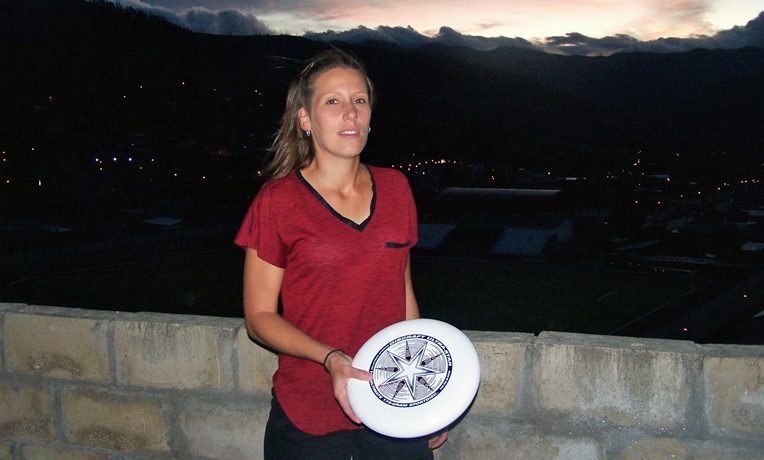 “I´ve been playing Ultimate Frisbee since church camp when I was 14 or 15 years old,” said the Washington state native, who is also an avid runner and a sports enthusiast in general. 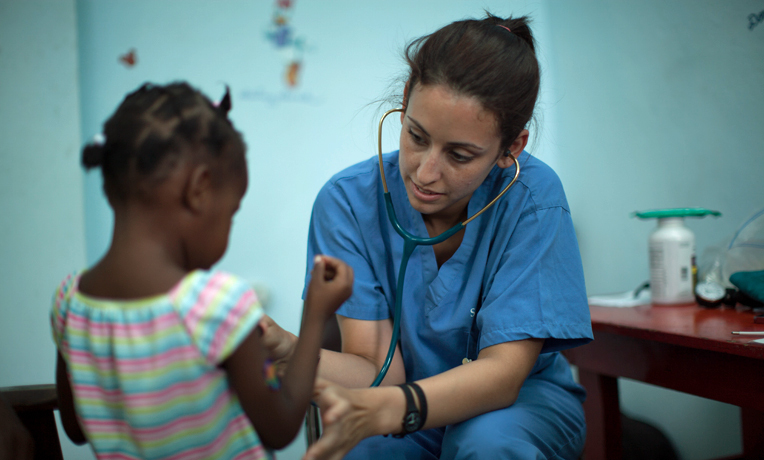 Cale introduced Frisbee to the surrounding community when she came to the hospital in January 2014 to serve through World Medical Mission’s Post-Residency Program. In a country where soccer is king, most people have never heard of “Ultimate Frisbee.” Even in large cities like Lima and Cusco, stores don’t sell discs. Cale receives a fresh supply from her parents and missionary friends when they make periodic visits to Peru. 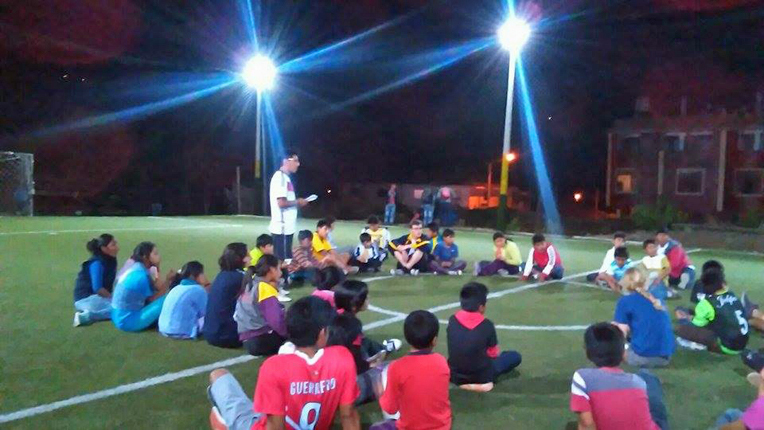 It didn’t take long for the kids and adults in Curahuasi to embrace the new sport. 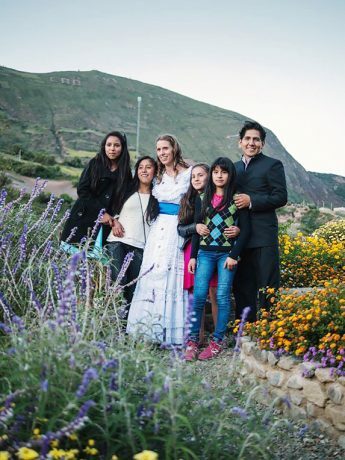 At first her church’s youth group leader, Miquias, rented the Diospi Suyana school gym. The turnout fluctuated from five to 25 participants. Last July they moved the games to a turf field in the center of town, playing every Wednesday night. Within two weeks the attendance numbers grew to 40. Now more than 50 people come to play each week, ranging in age from 5 to 55. Ultimate Frisbee is how God brought Cale and David, a local primary school math teacher, together. David started playing Frisbee last March. Cale was delighted to meet someone who shared her love for Jesus Christ and who felt called to serve in missions. The couple were married January 23. Building camaraderie is an important by-product of the games, but Dr. Cale and David recognized the even more important opportunity it afforded to share the Gospel. When she invited people from the community to come to church activities, few showed up. Yet even in pouring rain, there was always an enthusiastic turnout for Frisbee. In September, she, David, and Miquias began presenting short devotional messages during “halftime.” They also invited teen Frisbee players to their church’s Saturday night youth fellowship gatherings. Among this group are four 12-year-old Quechua girls: Xiomara and her friends Ariana, Rut, and Marciella. Cale walked into the hospital clinic one day and found Xiomara waiting to see her. While giving Xiomara medical treatment, Cale put her at ease as they chatted about playing Frisbee. Ever since, Xiomara and her friends have, in Cale’s words, “stuck like glue” to the doctor. One Saturday Cale stayed late at the hospital to help deliver a baby. When she arrived at the Frisbee/youth church event, the girls were waiting for her. They refused to play until she arrived. Cale completed the Post-Residency Program in December 2015 and is excited to continue working at Diospi Suyana for at least two more years. Some of the patients she sees at the clinic are family members of the Frisbee players. 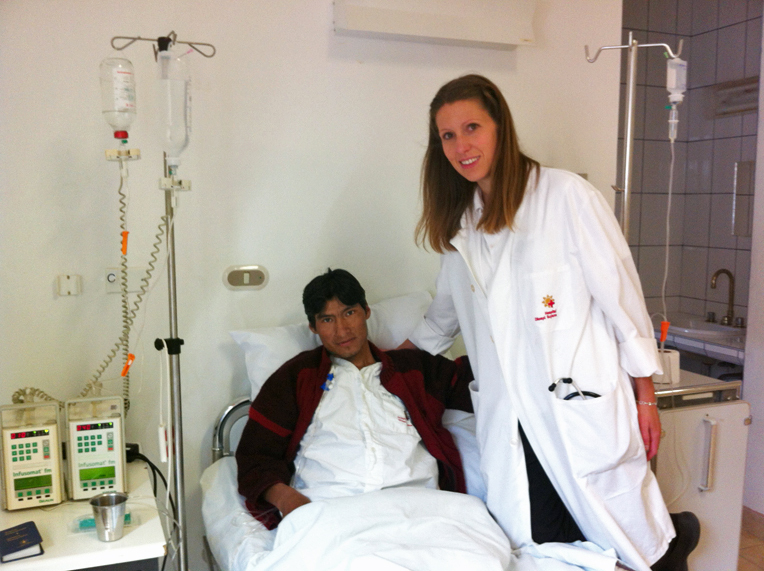 Others travel 12 or more hours by bus from Andean villages or the jungle to receive medical attention. Whether she is treating a respiratory infection or giving pointers on how to pass a Frisbee, Cale recognizes ministry opportunities with each individual she meets. 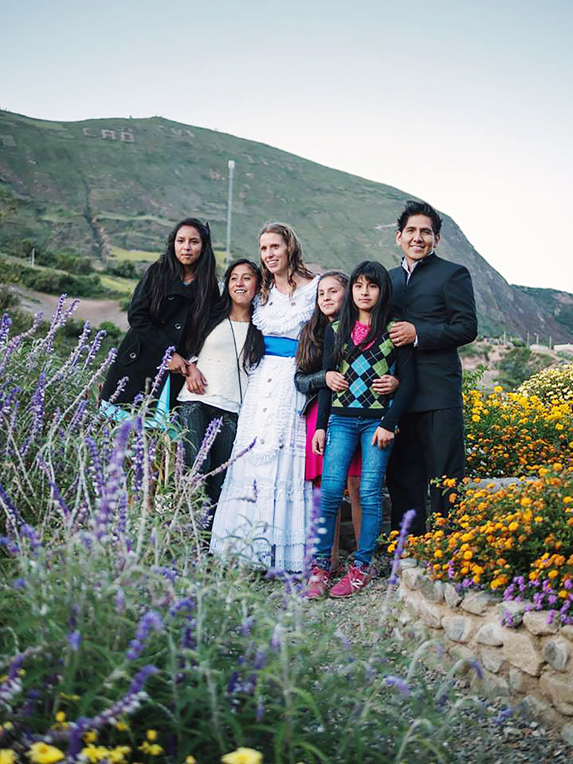 Her “ultimate” purpose is fulfilled as she sees Peruvian friends find new life through faith in Christ.